My friend Nick O'Neill over at AllFacebook posted an interview from the SXSW interview which I covered previously. He also got a chance to sit down and chat with Facebook CEO and founder Mark Zuckerberg while at SXSW and titled it My Interview With Mark Zuckerberg. This flash wine event is one that will go down in SXSW lore - find out just how it all went down with a little social media help. Adriana Gascoigne shares some Bub.blicio.us video episodes she shot while at SXSW. Also check out this great post filled with SXSW photos. Mark Zuckerberg had a Q & A with a number of the developers that were present as well as a few other people at SXSW. Quit your day job and VLOG!!! One of the keynotes at South by Southwest was Jim Coudal, founder of Coudal Partners and advertising platform “The Deck" spoke at SXSW about his theory on creativity and included one of his well known clips about the creative mindset. 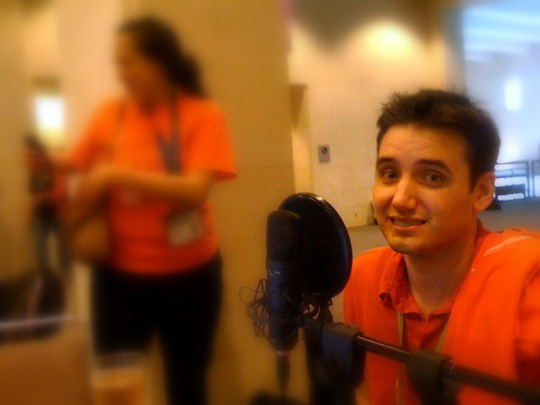 I sat down to chat with Aaron Brazell, Director of Technology at b5media, in the hallway at SXSW. Rumors are flying that Yahoo intends to integrate video into Flickr very soon, perhaps in the next three weeks. Part of the delay may have been a long internal debate about how to make Flickr Video special and distinct from what YouTube already offers. Stowe Boyd gives his perspective on Yahoo's recent move towards embracing the semantic web. As magazine publishers struggle to redefine their medium because advertisers are migrating to digital media, publisher Meredith Corp. has purchased two interactive advertising agencies, genex and New Media Strategies. This feature applies to all eligible videos uploaded from the YouTube community, and is not restricted to partner content, so everyone can enjoy this upgrade. Blake Robinson compares FriendFeed and SocialThing for us all on ReadWriteWeb. The fledgling startups listed below will present their ideas and initial products to investors at this spring’s Y Combinator Demo Day on March 18. Of the 19 companies in this batch, 10 have already launched and only one remains in stealth mode. Kara Swisher says she thinks AOL bought KickApps for $90 million. AOL has acquired social networking site Bebo for $850 million in cash. Time Warner Chief Executive Jeffrey Bewkes has said that Time Warner is open for a deal on AOL.